But Ivy’s lifelong gift—or curse—remains. She sees the uninvited ones—ghosts of loved ones who appear to her, unasked for and unwelcomed, for they always herald impending death. On that October evening in 1918, Ivy sees the spirit of her grandmother, rocking in her mother’s chair. An hour later, she learns her younger brother and father have killed a young German out of retaliation for the death in the Great War of Ivy’s other brother, Billy. Horrified, she leaves home and soon realizes that the flu has caused utter panic and the rules governing society have broken down. Ivy is drawn into this new world of jazz, passion, and freedom, where people live for today, because they could be stricken by nightfall. 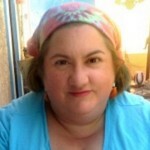 She even enters into a relationship with the murdered German man’s brother, Daniel Schendel. But as her “uninvited guests” begin to appear to her more often, she knows her life will be torn apart once again, and terrifying secrets will unfold. Cat Winters’s debut novel, In the Shadow of Blackbirds, was released to widespread critical acclaim. The novel has been named a finalist for the 2014 Morris Award, a School Library Journal Best Book of 2013, and a Booklist 2013 Top 10 Horror Fiction for Youth. 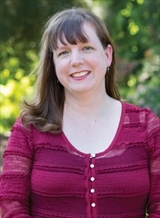 Winters lives in Portland, Oregon, with her husband and two children. From the first page there’s a slow, sort of watery feeling to this book, as if you’re seeing everything through a lens coated with vaseline, or looking through pond ripples, are recovering from a deadly fever. Its a feeling that is obviously intentional, as even a few scenes that should be brutal have a touch of unreality to them – not in the sense that they’re not plausible – but in the sense that a sort of dream-state is still lingering. Partly, this is because protagonist Ivy can see ghosts, and her long-dead grandmother has just visited. This means someone else’s life has been lost. Author Cat Winters has a great feel for tone. Ivy’s walk felt ploddingly long and her arrival at the hotel was such a relief but the other-ness of the story never really left, so much as it was driven back to the corners as Ivy claimed her own agency. The characters we meet later, especially Lucas, May, and Daniel, are all fascinating studies in extremes – the fervent idealistic patriot, the wounded widow, the immigrant who fees downtrodden – they are archetypes, but they are also so much more. Rich and layered, all the characters in this novel feel like people we all might have been related to, once upon a time. That sense of familiarity makes them seem all the more dimensional. It’s quite a trick. 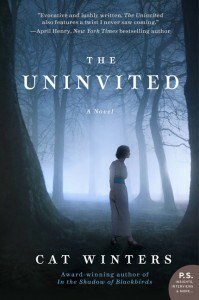 I felt The Uninvited was well paced, and well plotted. I especially liked the way the twist near the end was handled so subtly. Like M. Night Shyamalan’s vintage work (you know, back when his stuff was good) the clues are all there, and things that are easily missed on a first read seem painfully obvious once all is revealed. I’m not sure if this novel is horror or supernatural romance or kind of both…but it was a gripping read, and I thoroughly enjoyed the experience. Goes well with homemade apple pie, served warm with vanilla bean ice cream and a cup of strong coffee.